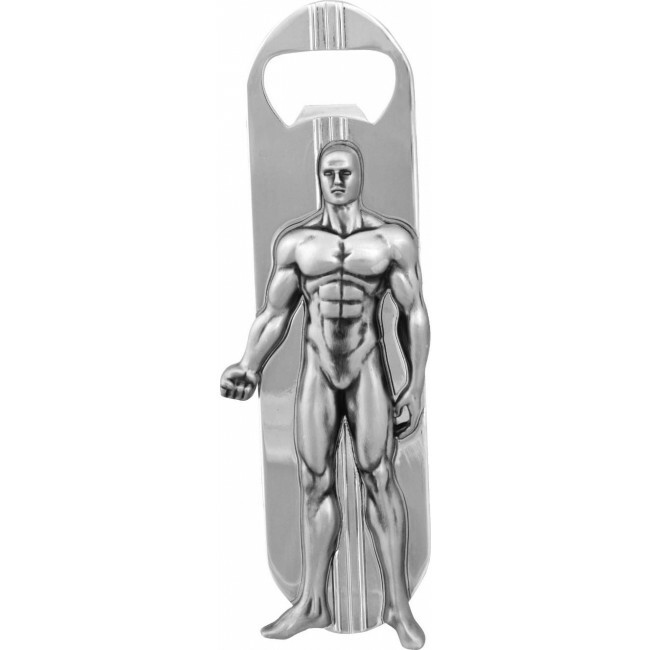 The first ever Silver Surfer bottle opener! We know Galactus hungers, but does he also get thirsty? Does he ever dispatch his heralds to find him a cool, frosty beverage planet to drink? Well, now you can use the power cosmic to crack open a cold one with this shiny bottle opener shaped like the Silver Surfer and his board! Crafted in solid metal, this surefire conversation piece should be in every comic fan's kitchen, for when your guests want a cold beverage and simply crying out "Make Mine Marvel" won't do the trick! Measuring six inches long, this original DST product is packaged in a collector's case with a full-color wrap.